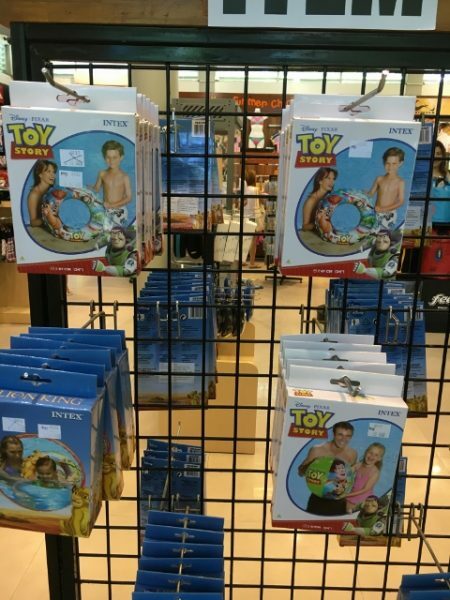 This post contains compensated links. Please read our disclaimer for more info. 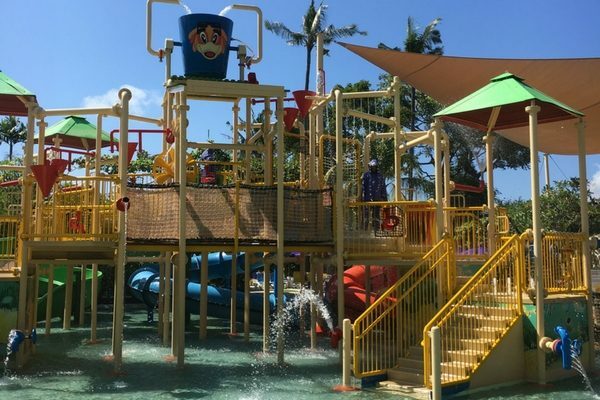 When we holiday in Bali the number one thing on our list of things to do in Bali with kids, is a visit to Waterbom Bali. 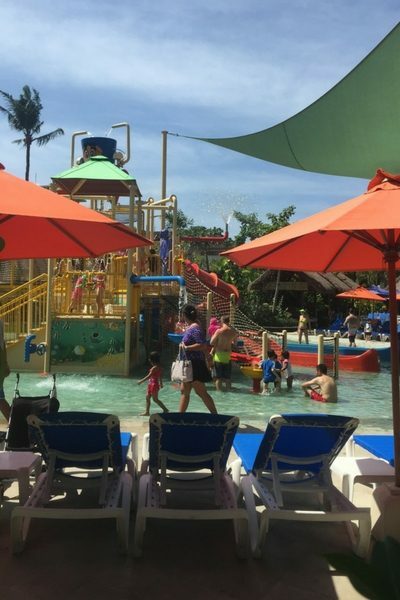 This Bali water park is amazing and has something for every age including big kids! 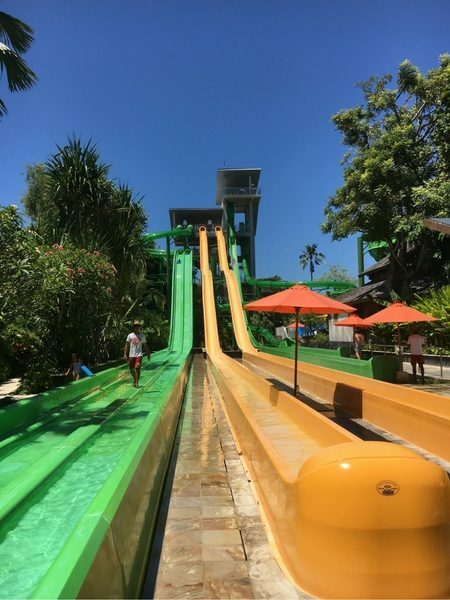 Over the years I have ventured to Waterbom 6 times so have lots to share on all things related to a great day out Bali Waterbom Park. 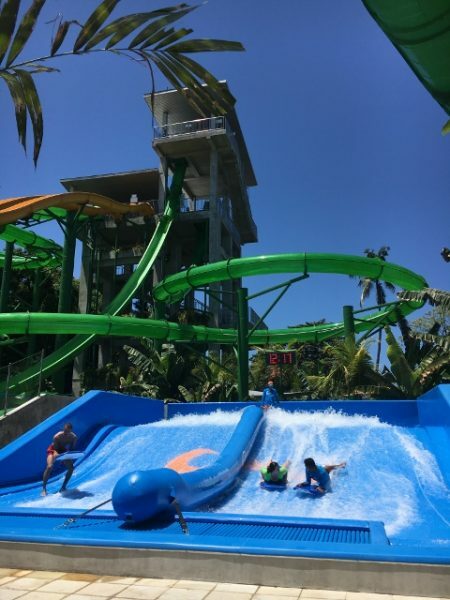 Check out this ultimate Waterbom Bali guide if you are planning a visit and also check out our blog posts from 2012, 2013, 2015, 2016 and 2017. These detail our previous holidays with the kids where we show everything we did on our visits to Bali Waterbom park. 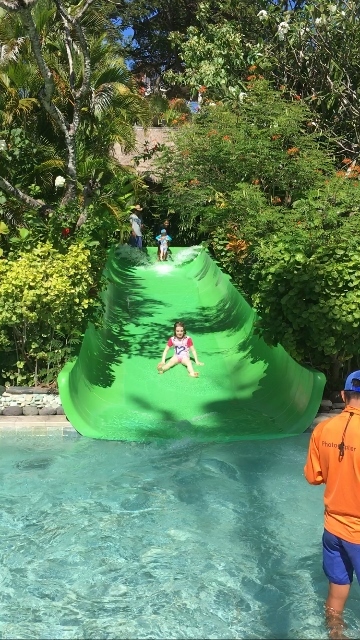 Waterbom in Bali is rated as the best waterpark in Asia so head along for a great day out! 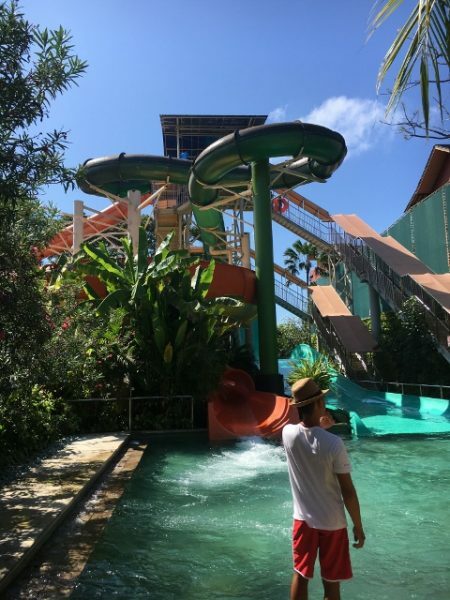 1 Where is Waterbom Park Bali? Where is Waterbom Park Bali? 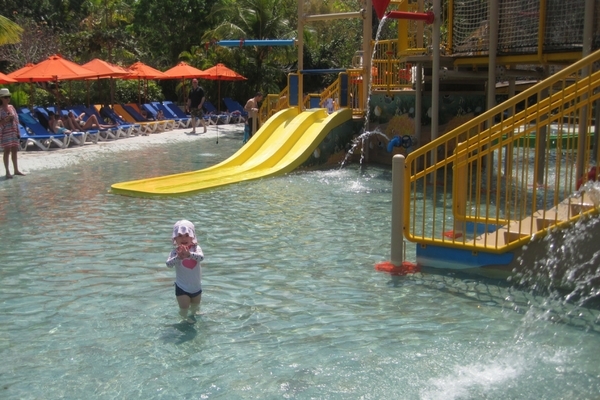 Water bom park is located in Kuta, Bali, Indonesia and is close to shops, restaurants and hotels of Kuta and Tuban. It is directly across from Discovery Mall and easy to get a taxi to. 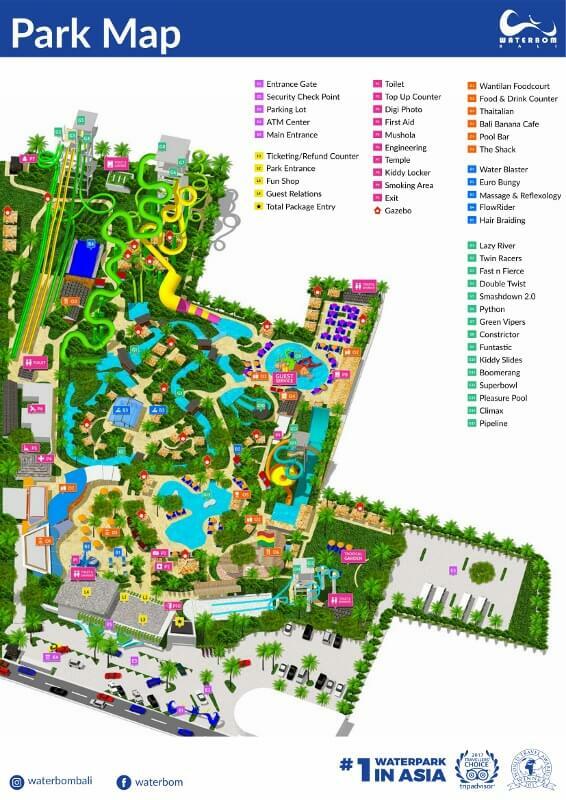 This Waterbom park map is from Waterbom Bali site. 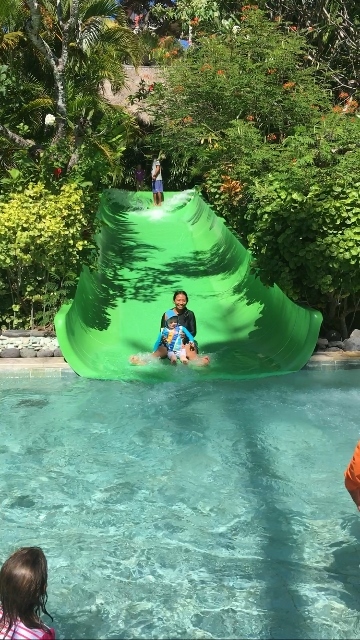 Waterbom Kuta is open from 9am to 6pm everyday including Christmas Day. The only exception is Nyepi Day (Day of Silence) where the park and the whole island is shutdown with nothing open not even the airport. This date changes each year but is usually in March and for 2018 is the 17th of March. If you love to save money then the best place to find cheap Waterbom tickets online is either through Waterbom website or different booking sites like Govoyagin often have deals. 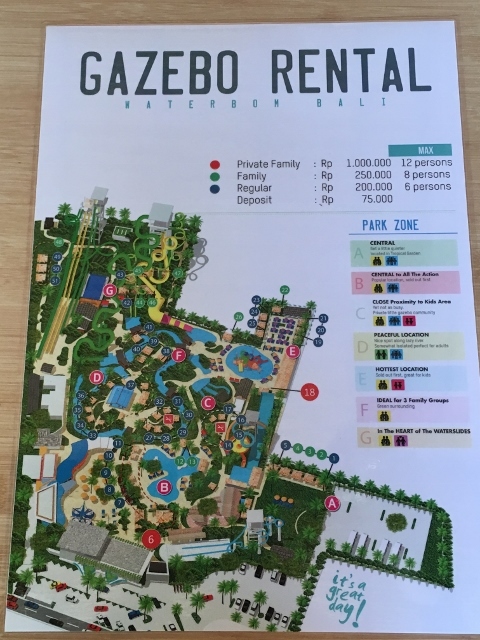 The best place to buy Waterbom park tickets seems to be through the main Waterbom website as you can also select the gazebo area as well but not the exact gazebo number. I would highly recommend pre-booking tickets as the queue for the pre-purchase counter is always a lot shorter. We haven’t ever purchased the VIP pass and I’m not sure if it’s worth the extra cash. Below is the sites that I researched on 11th June 2018 for the best Waterbom Bali price for our family. 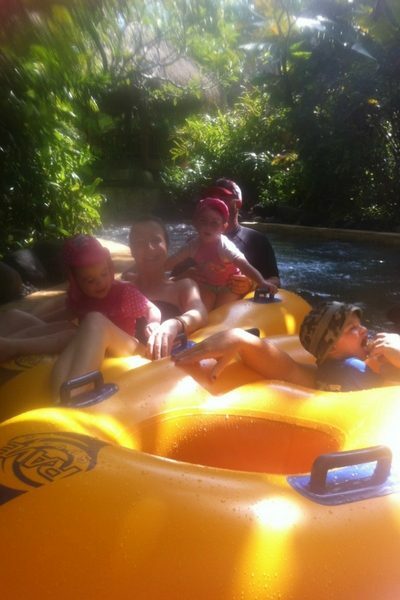 A Waterbom family pass consists of 2 adults and 2 children aged 2 to 11 years. Remember that if you have infants under 2 years they have free entry. 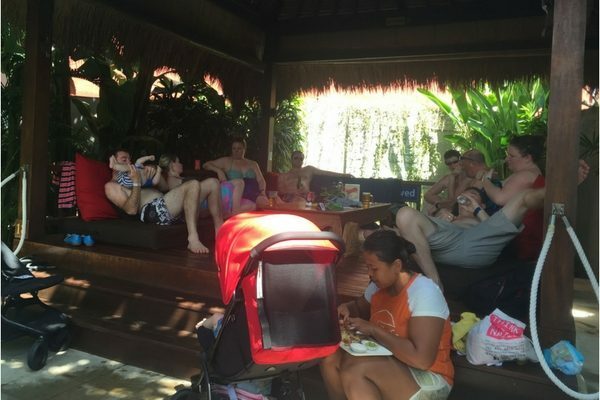 Also if you are taking a Bali nanny with you to help out like we often do, they get a discounted rate for being local. You can book this online too or at the gate. It is easy to buy tickets at the gate when you arrive, sometimes there is a line up but it usually moves pretty quickly. Occasionally in peak times they do close the gates if the park is at capacity so during peak times it is worth arriving early. Kids aged under 2 are free into the park and 2-11 years are classed as children when buying tickets. You can find tickets here direct with Waterbom. For families traveling with grandparents to Waterbom they offer 50% off entry for Seniors aged 66 and over. Tickets must be purchased at the Waterbom entry counter so that age can be proven. Thanks to Michelle from our Facebook group for this great tip. 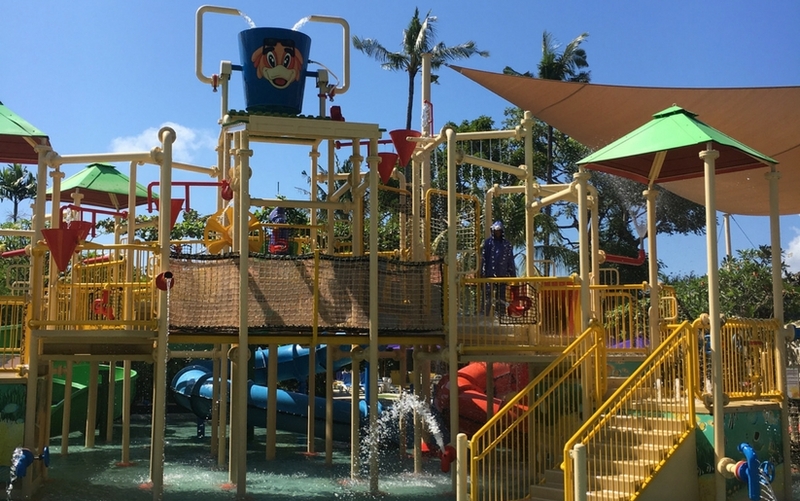 The kids area is fantastic at Waterbom! Lot’s of fun things for the younger kids to explore and have a fun day out. The slides are perfect for once the kids are walking and be sure to take a nanny to run around after the kids! They can gain entry at the local price, so be sure not to purchase them an adult ticket until you arrive. 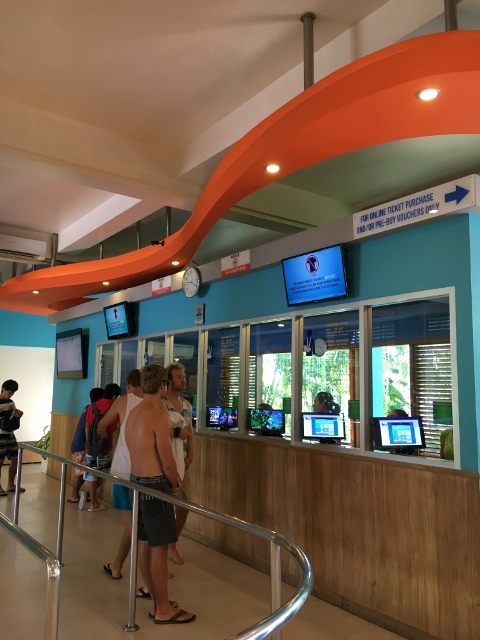 This can be done at the pre purchase counter if you have booked your family Waterbom tickets prior to arrival and are needing to pick them up. 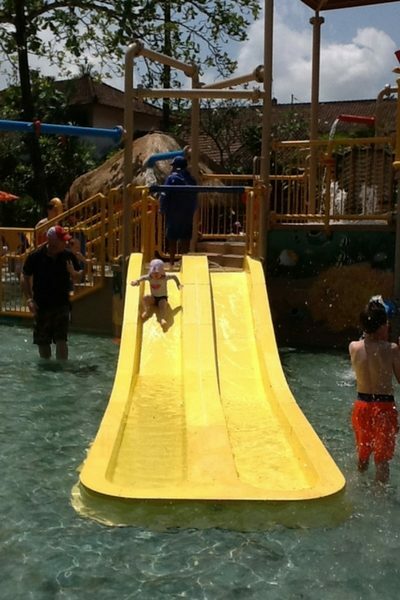 Kids zone at Waterbom Bali, the best water park in Bali! The water slides in the kids area. Charlotte was 23 mths here. 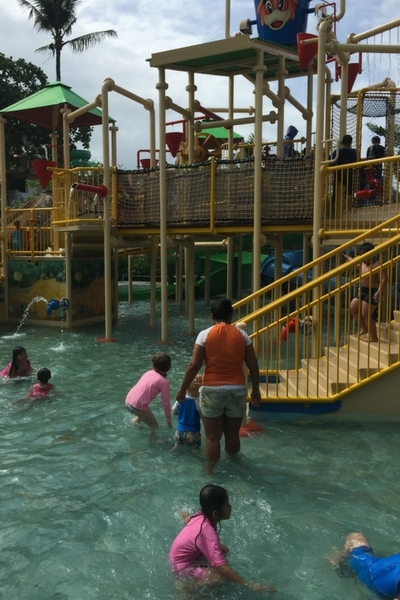 A visit to Waterbom water park with the kids can be made even better when you hire a gazebo. This is a great way to settle in for the day and have all your stuff in the one spot. 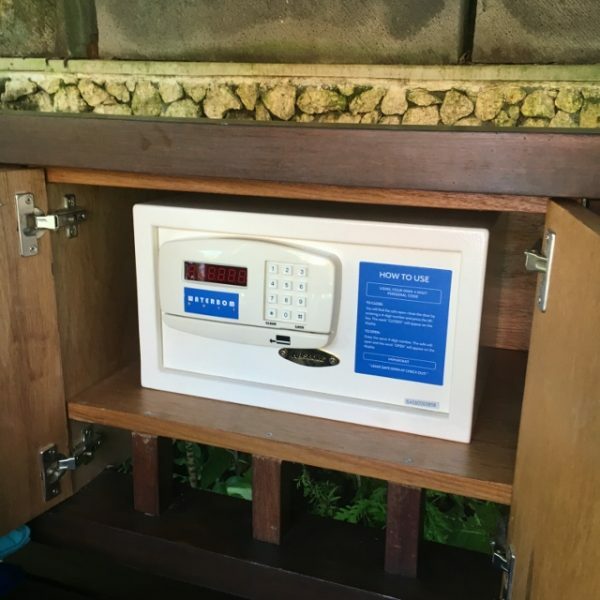 Each gazebo comes with a safe so you may not need to hire one of the Waterbom lockers. We have used a few different sized gazebos over our last few visits and in different spots. Our biggest tip would be to get there at or before 9am if you want to guarantee one of the Waterbom park cabanas near the kids zone. These do go quickly! 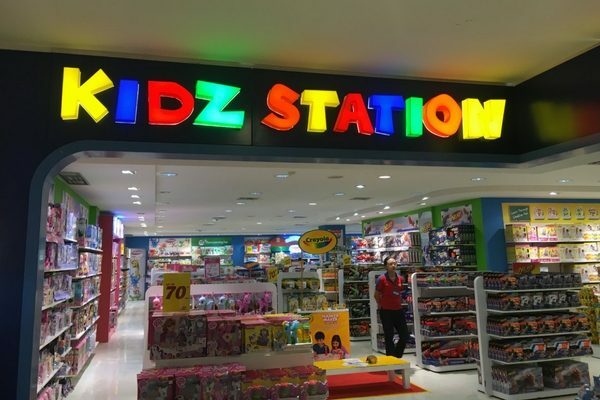 To book these gazebos, you pay at the entrance and then head straight to the counter in the kid zone to be allocated one. Even if you pre-purchased Waterbom park gazebo hire through their website, you can’t actually choose exactly which gazebo you will have. You can however now choose which zone they are in. This isn’t particularly clear on their website so on my August 2018 trip I will verify with them. 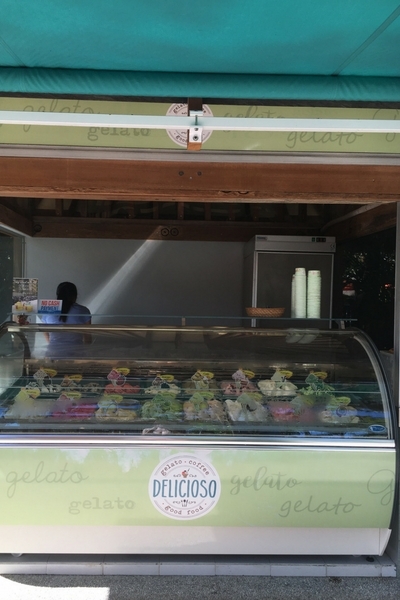 For any other gazebos in the park, you head to the counter in the locker area near the entrance. Please note that the rates listed below were current in September 2017 and may change. On our 2015 extended family holiday we hired this huge gazebo as there was 13 of us. We had number 18 which is the one located near the kids zone and the price included a drink (soft drink or water) for 6 people and 6 towels. It was really private and had plenty of space for all of us including a safe and lounge chairs to lay on. The younger kids could easily have a sleep in their Mountain Buggy Nano Stroller. Price: IDR 1,2500,00 with a IDR 75,000 deposit and recommended capacity 12 people. In 2013 we were lucky enough to get number 22 gazebo, the family gazebo near the kids zone. These go very quickly and was perfect for 2 families. Price: IDR 300,000 with a IDR 75,000 deposit and recommended capacity 8 people. Our last trip in 2016 we hired number 16 gazebo as all the gazebos near the kids zone were gone when we arrived at 9:20am. I actually really liked this spot as it was quiet but close to the kids zone but without the screaming kids! I also managed to pick up the WIFI from the cafe nearby and the size was perfect for our family of 4 with out nanny Kadek. Price: IDR 250,000 with a IDR 75,000 deposit and recommended capacity 6 people. The lockers are a great way to keep all your gear together securely and are located in different areas around the park. The cashless wristband that you purchase at the entrance allows you easy access to the lockers. Towels can be hired which is perfect if you don’t want to lug a whole lot of wet towels home. Waterbom park tickets allow you to ride as many water slides as you can! If you are like me and aren’t a huge daredevil but enjoy a swim, then the main pool is a great spot. 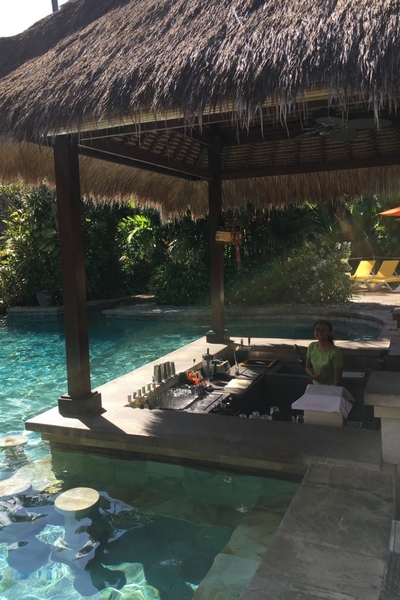 We tend to go for a swim earlier in the day as the pool bar can get a bit rowdy after lunch! 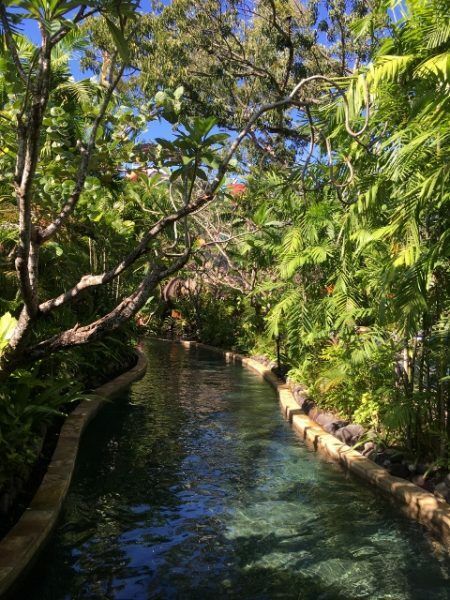 Perfect with the kids, the lazy river is my go to ‘ride’ now that I can’t do the bigger slides! Easy and relaxing, the whole family can enjoy it. The slides located near the Funtastic kids area are perfect for the younger kids and Mum’s and Dad’s can go down with the younger ones too. Our kids loved this area and is a great spot for the under 4 yrs age. Charlotte, aged 5, found the kids slides easy! Using a mat you head down racing head first! Charlotte loved this with Jed last trip as she was above 110cms tall. 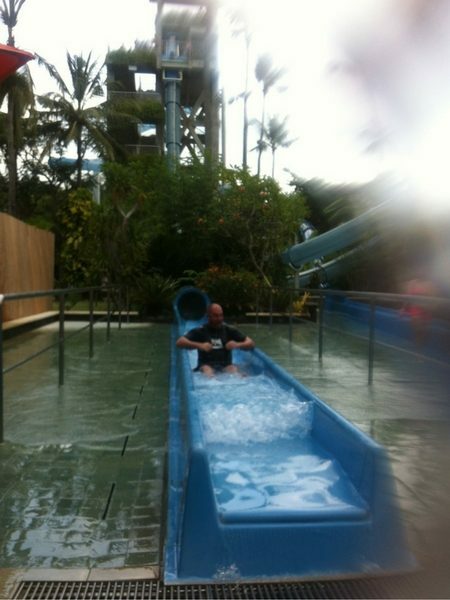 The Waterbom Bali Smashdown 2.0 is an extreme ride and not for the faint hearted!! You need to be 122cms to attempt this one. This one is all about speed and beating your friend down to the bottom. 120cm tall is the go on this one. 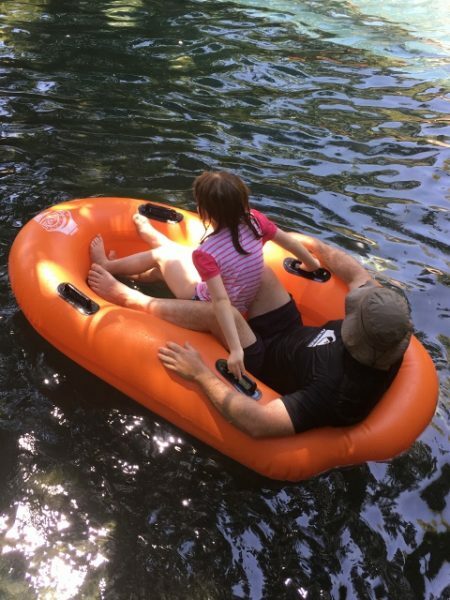 Lots of fun on a tube and best when you go with a friend, you will need to be 120cm to give this one a go. The Python Waterbom Bali is a fun ride that can take up to 4 people in a raft. Charlotte, Jed and I had a go of this in 2015 and I got told off from Charlotte, at age 4 yrs, that I was screaming too much!! The kids need to be 100cm to give this one a go with Mum and Dad. Fun with a friend, this tube ride is great for all ages but you do need to be 122cms tall to give it a go. 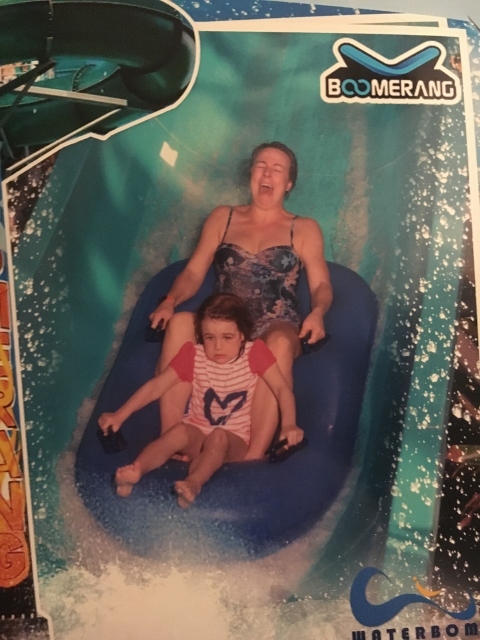 Ok so I was brave enough to try this last trip, my face says it all! Need to be 122cms tall to try this extreme one out. The start of this one is why I probably haven’t tried it yet! Extreme and you need to be 122cms to have a try. I still remember Charlotte coming back to our gazebo when she was 4 yrs saying ‘Berta and I just went down the big green one!’ It goes quick but kids above 100cms can give the open green viper a go. The Waterbom Climax is one of the scariest rides and no I haven’t tried it! Hubby did on a trip in 2013 and said it was fun. You need to be 120cms for this one. Located next to the Climax is one for the smaller daredevils as you can ride this one at 100cms tall. Again is extreme!! The Waterbom Flowrider looked like a lot of fun but I enjoyed a Bintang instead while watching everyone have a go! You need to be 130cms to give this a go and will cost extra as not included in the Waterbom park prices. You can buy either 1/2 hr or 1 hr long sessions and opens from 10am-5pm. Launching water balloons is a lot of fun and you can pay to do just that! 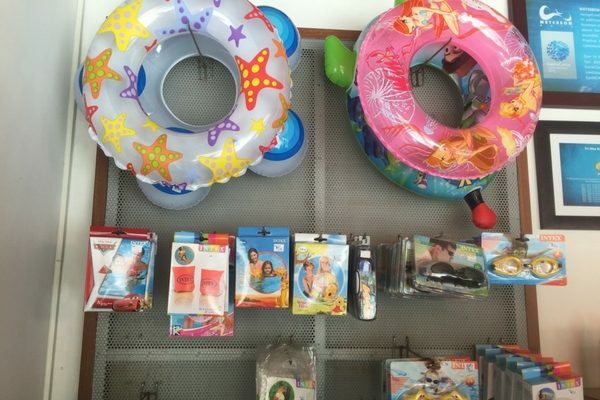 Kids under 6 need an adult to supervise them and you need to purchase the water balloons. 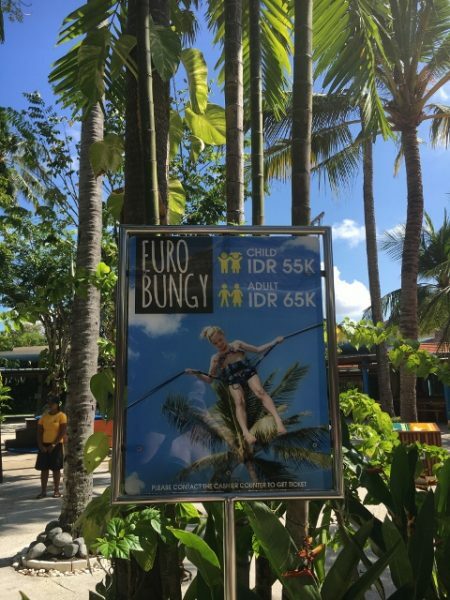 Kids were having a lot of fun on the Euro Bungy but the cost is not included in the Waterbom Bali ticket price. Charlotte wasn’t keen last trip when she was 5 years but Mason would have loved it but we didn’t know if we would get him off! Max weight is 80kgs to have a go. 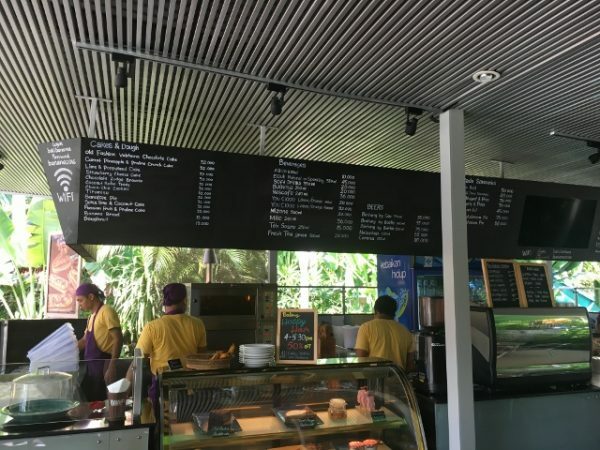 The food options are great at Waterbom! We usually just take in a few snacks for the kids and water bottles. 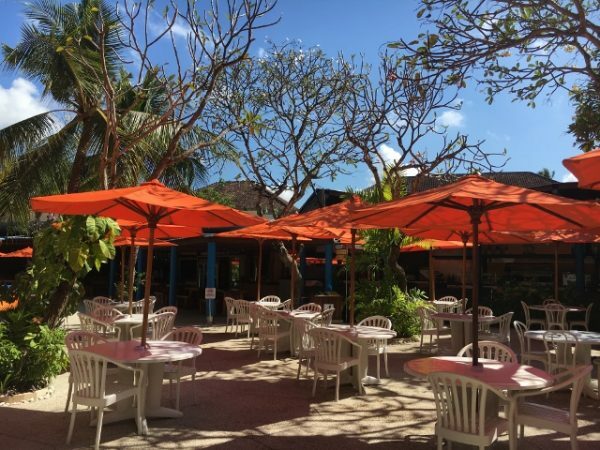 We find the food to be reasonably priced and something for everyone available. There is gluten free options available too with the pizza bases gluten free for an extra cost. 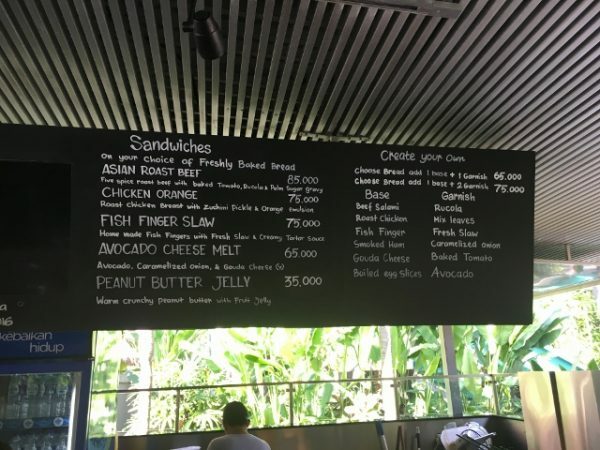 The food court has a huge range of different food and where we ordered lunch from last time. Was yummy and they delivered it to our gazebo. 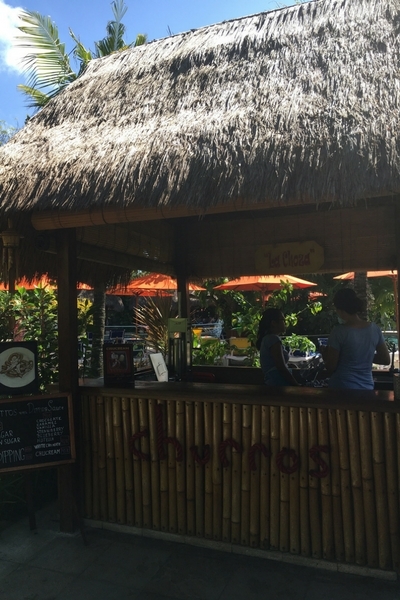 Located near the kids zone is a great cafe with sandwiches, drinks and cakes. 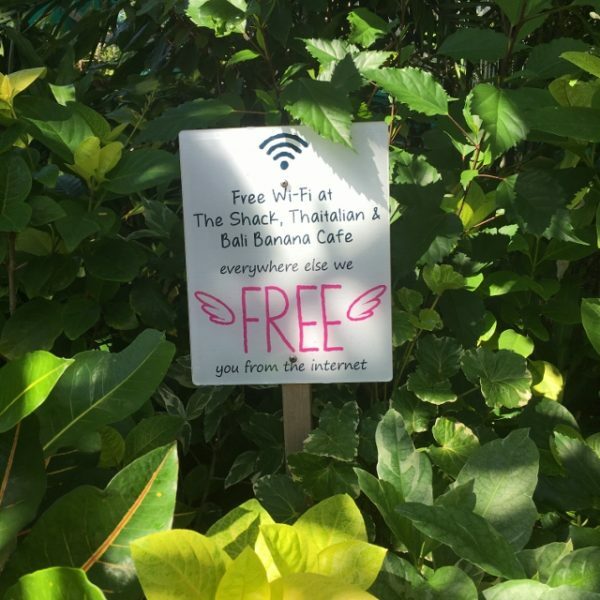 They also have free WIFI at this cafe. The main pool is where the teenagers and drinkers hang out so after lunch can get a bit more rowdy. Pool bar at the main pool at Waterbom early in the day! I had a bintang and snack while I watched the Flow Rider and it was good Thai and Italian food. 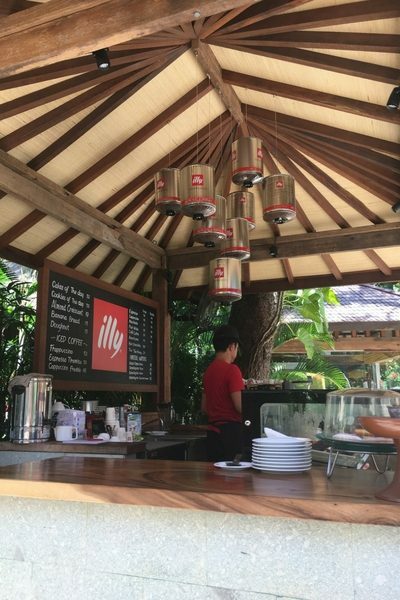 I do love a good coffee and the latte I had from Cafe Illy was good. Nothing to rave about but still drinkable! 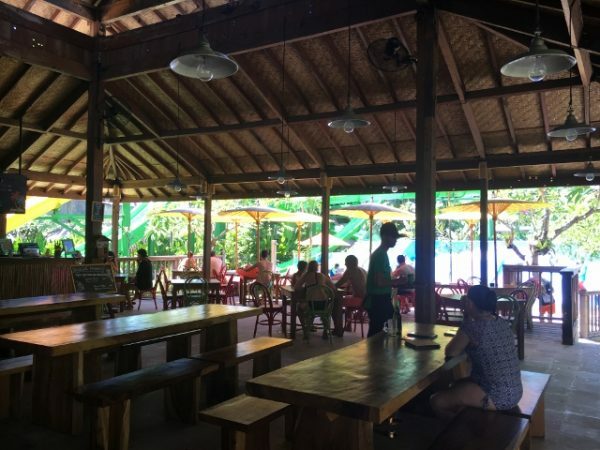 WIFI isn’t available throughout the whole Kuta water park but at 3 of the cafes. You just ask for the code and they will give it to you to use for free. At the entrance to the park is a shop with anything that you may have forgotten for your day out. 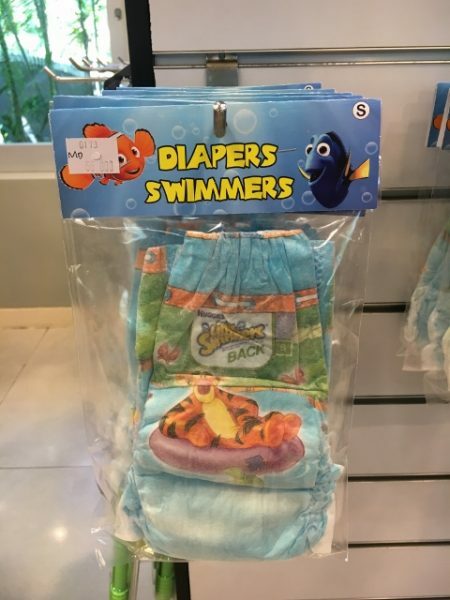 I once forgot my bathers and had accidentally left them at our villa in Seminyak!! So silly of me but I manage to find a pair of Billabong bathers that I still wear today for a reasonable price. They weren’t really cheap but no more than what you would pay in Australia. 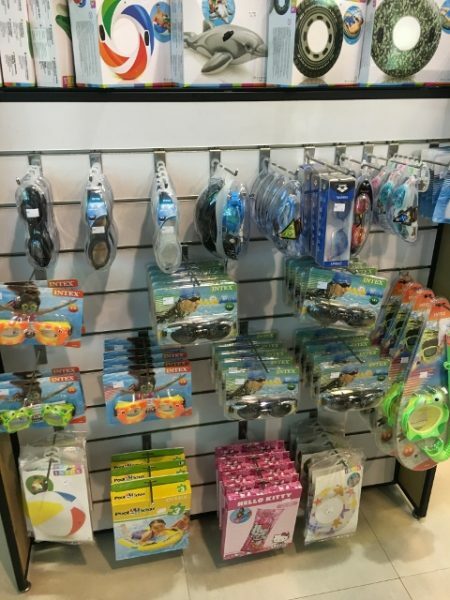 They have a range of swim nappies and other swimming products also near the kidzone if you run out. 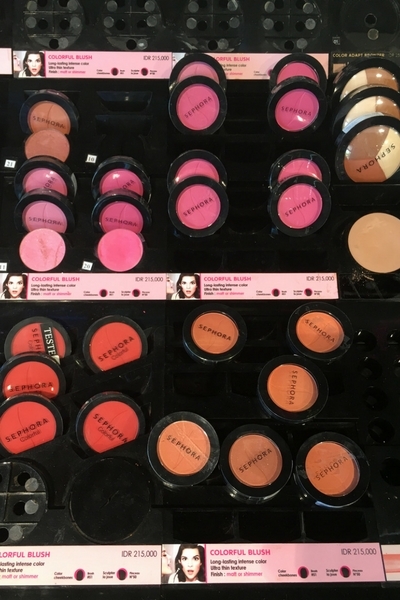 Shopping at Sephora was a lot of fun! Each vehicle that attempts to come to the entrance of the park is checked out and bags are checked after tickets are purchased. The park is extremely clean, each bathroom area has it’s own attendant! 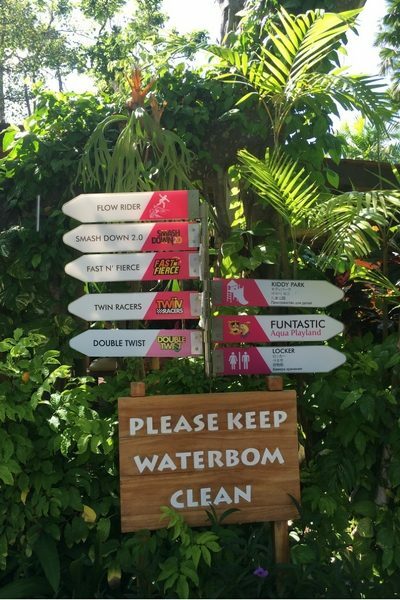 Australian waterparks take note!! We have always felt very safe at the park and the quality control is high. The splash bands are great as there is no need to worry about money during the day. 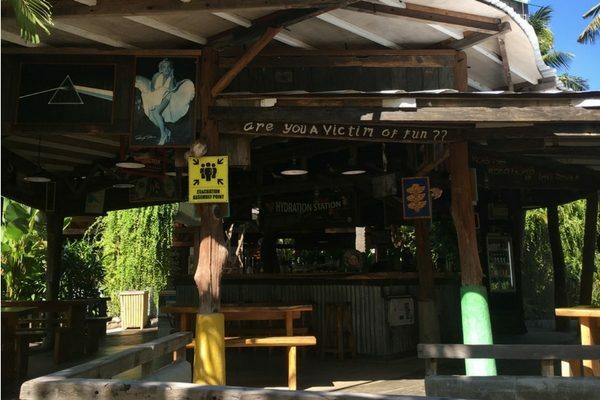 You simply load up any amount of money at the entrance and other points around the park to use at all outlets throughout the day. We usually load up $100 AUD for the day and if we need more cash it’s easy to load and if we don’t use it all you can easily get the money refunded when you hand in the band. Where you always find me!! 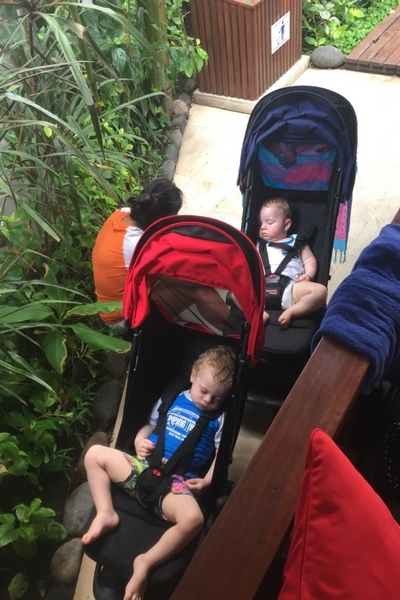 There are many ramps into and around the park and we always find it easy to push a pram around. 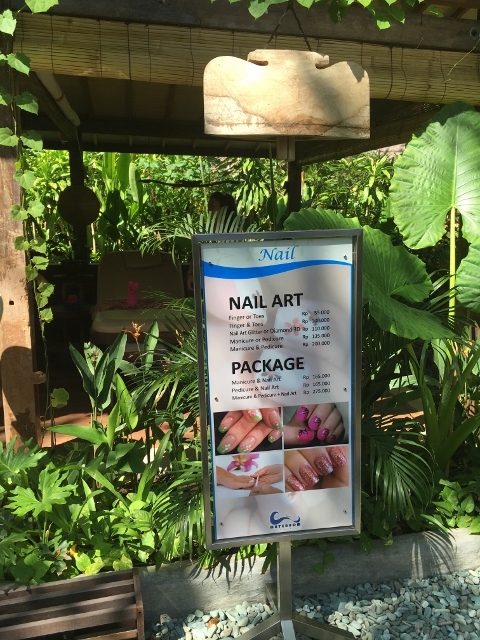 There are some fabulous kid friendly resorts near Waterbom and our picks would be the following as seen in our Ultimate Bali with kids guide which you can find here. 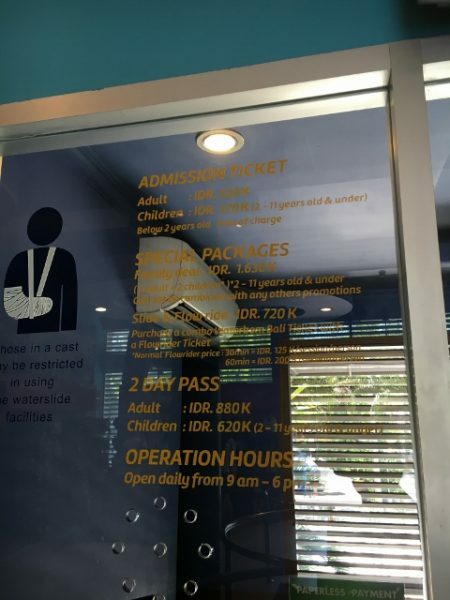 These hotels near Waterbom park Bali have amazing kids facilities and will often have discounts to Waterbom available so make sure to ask if you haven’t pre-purchased your cheap Waterbom tickets. 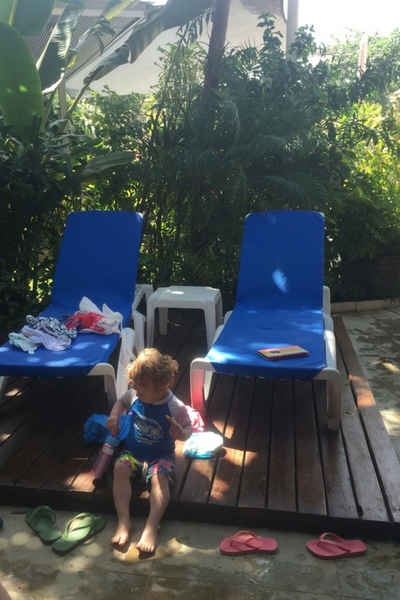 We loved our stay at Holiday Inn Resort Baruna. 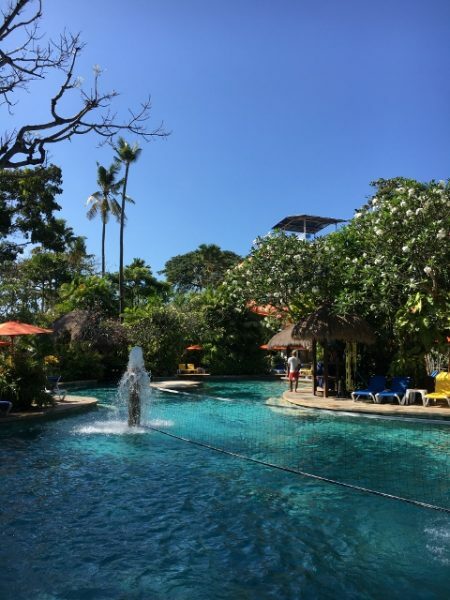 I’m not usually a Kuta fan but really enjoyed the beautiful gardens and pool area. 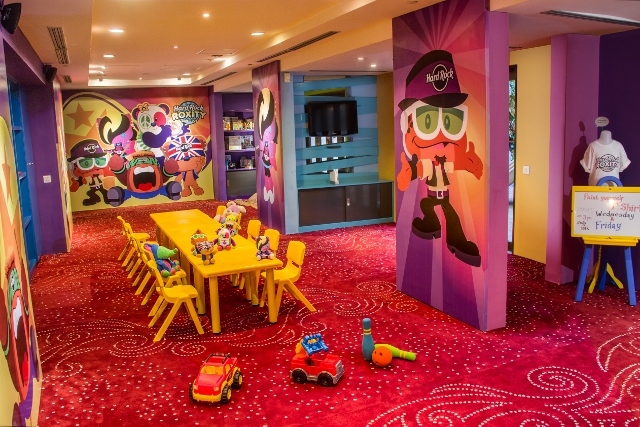 The rooms, although not ultra new, were comfortable and the kids especially loved the themed rooms of the kids suites. 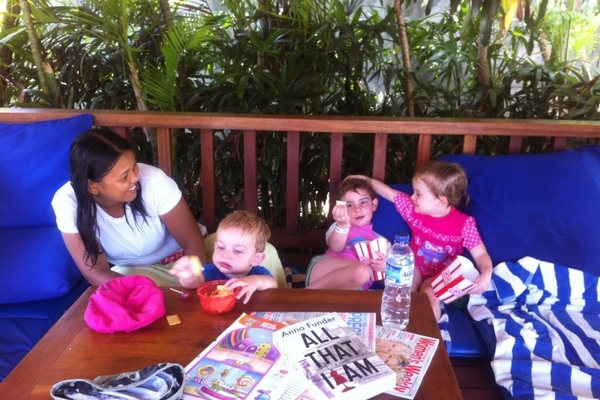 We couldn’t keep the kids away from the kids club and the Tea Tree Spa gave us one of the best massages of our trip. To check out prices and more info for Holiday Inn Baruna click here. 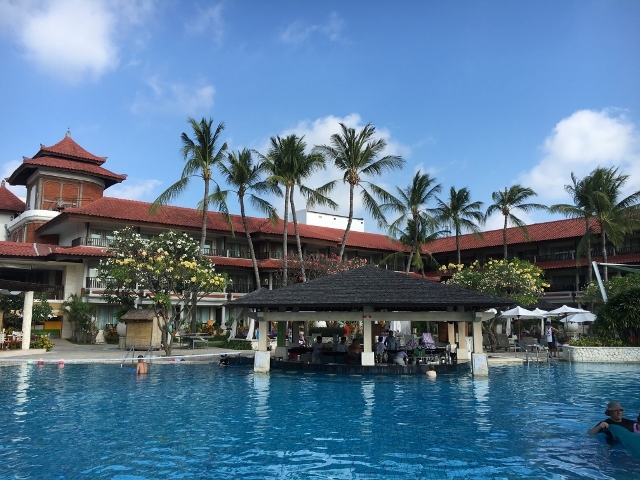 If you are after a fun hotel with lots of things to do the Dynasty Resort Bali is for your family. A huge range of activities for the kids to do, the school aged kids will especially have a blast. I was a bit surprised to see it wasn’t directly on the beach front when I walked through last trip and the pool area did seem quite busy so if you are after a more relaxing time perhaps look elsewhere. The Hard Rock Bali Hotel is known to be a kids paradise. 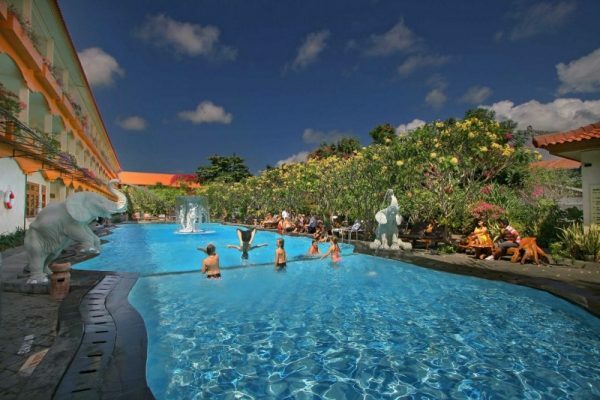 The fun pools, cafe and kids club make this to be one of the best hotels in central Kuta. If you don’t want to be in the middle of the action the Hard Rock is not for you, but if lots of things to do with the kids then you have found your spot. 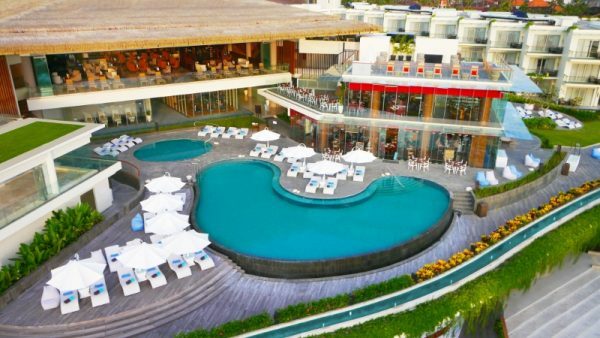 Sheraton is in a fantastic position linked to the Beachwalk Mall in Kuta. 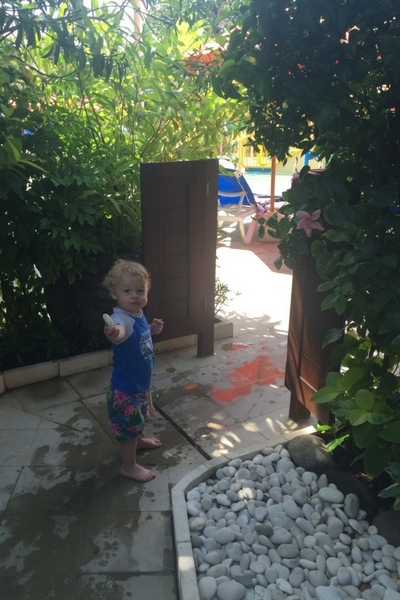 The facilities are great for a relaxing stay for Mum and Dad with the kids being in the centre of everything. They also have an excellent Sunday Brunch so coinciding your stay over a Sunday is a great idea. 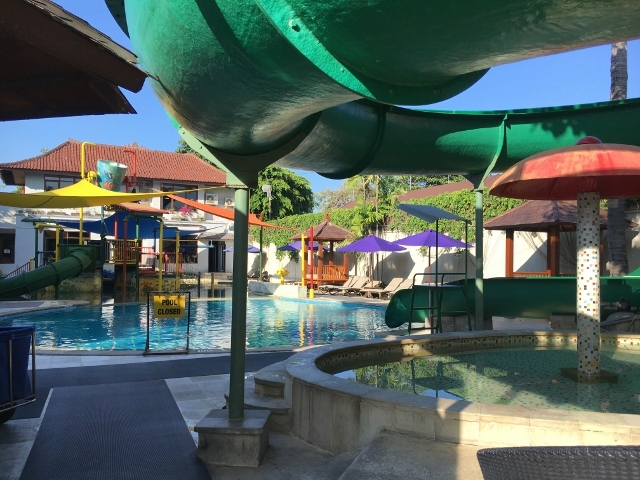 If you are after a cheaper hotel in Kuta that still has great facilities for kids then Febri’s Hotel & Spa is a great choice. 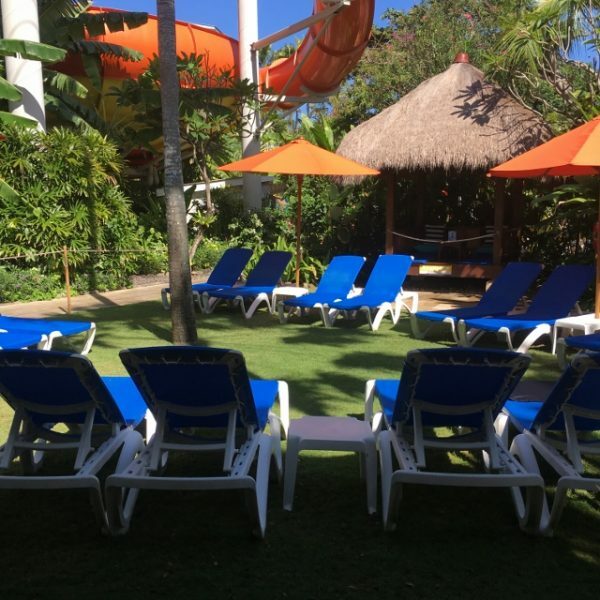 The family rooms are great value and the kids playground near the pool is great for the kids. 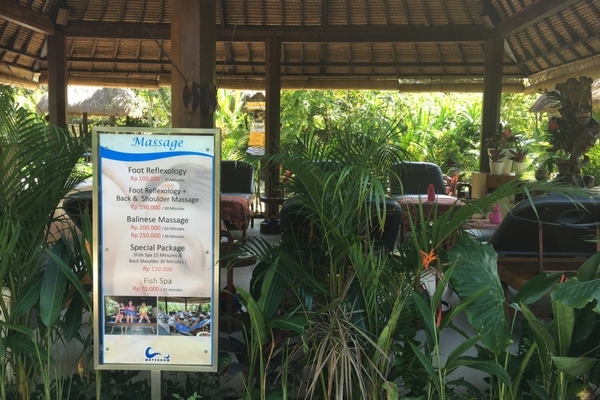 We hope you enjoyed our Waterbom Bali review or reviews!! Please feel free to ask any questions or give suggestions on how we can improve this post via email. Feel free to chat over at Facebook or Instagram and if you are keen, come join our Facebook group! Disclaimer: This post contains affiliate links that if you click on then and then purchase through that link we will make a small commission. 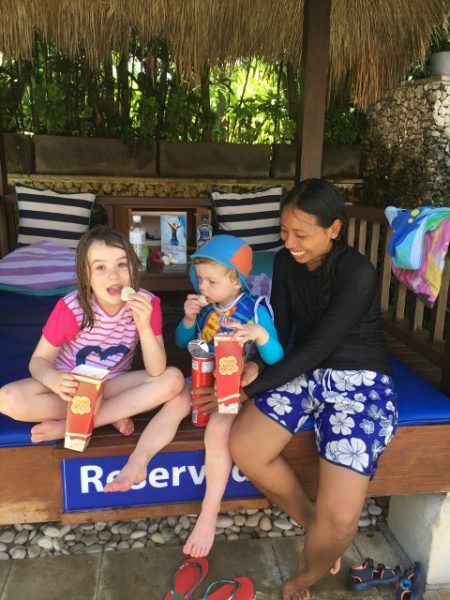 This is at no extra cost to you but helps support our blog and keep bringing you great content on travel to Bali with kids. Thanks! 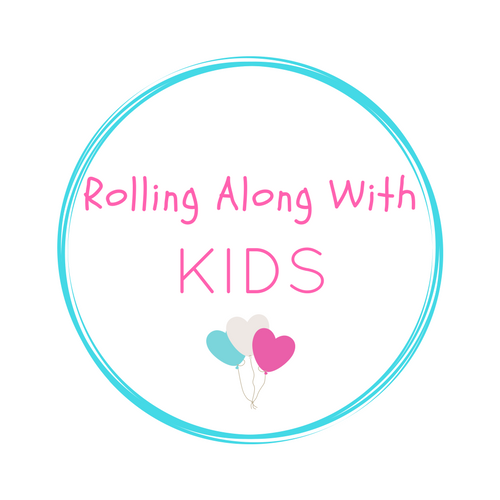 Rolling Along With Kids is a participant in the Amazon Services LLC Associates Program, an affiliate advertising program designed to provide a means for sites to earn advertising fees by advertising and linking to amazon.com, amazon.com.au, amazon.co.uk, amazon.ca. Amazon and the Amazon logo are trademarks of Amazon.com, Inc. or its affiliates. Thanks Kate. Another great comprehensive post. Thanks for all he great info. I am taking my grandchildren later in the year. One of my grandchildren is coeliac and needs a gluten free diet. I notice the menus are burgers and pizzas. Any chance there are gluten free options? Thanks so much for your kind words and enjoy your visit!! Great post, thank you for sharing Kate. We weren’t going to go but after reading your post we’ll be heading there for sure. 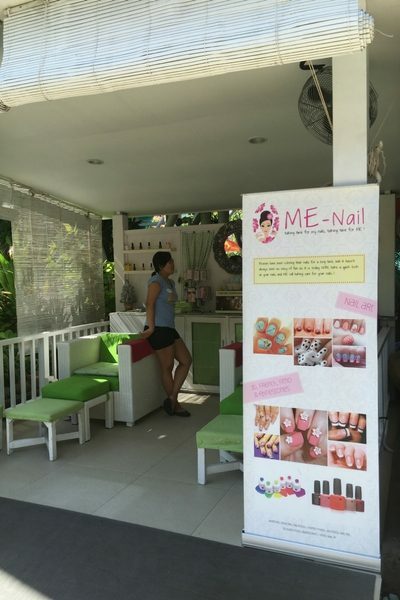 I didn’t realise it was so well serviced and suitable for little ones and pampering for Mum! Hi, would love an update after your August trip. We are going with our 6 children for Christmas 2018 (yes 6 kids) and although my husband and I have been to bali before it was more about food and massages than watermarks and zoos. Thanks! Thanks so much – this was exactly the info that I was looking for. 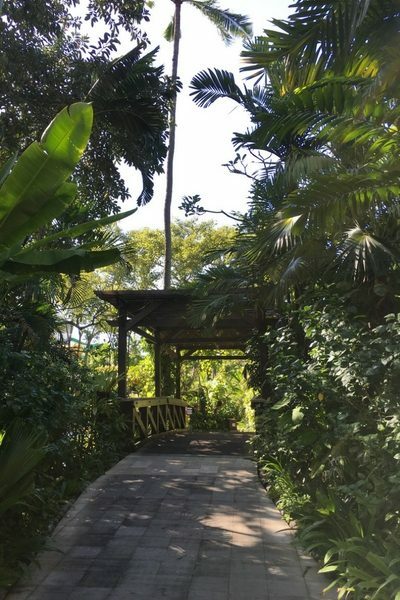 Also on our way there in December and would love to hear about your latest experience – especially regarding the gazebo areas – which is best for “with” or “without” kids.